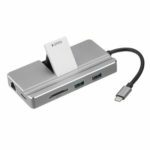 The 5 in 1 type C hub adapter has 3 USB 3.0 ports that allow for super speed file transfers of up to 5Gbps, while offering multiple mouse or keyboard connection. With the HDMI port, you can extend your screen at resolutions up to 4K*2K. 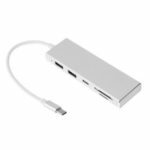 USB-C PD port allows you to charge your type C device while connecting multiple peripherals or transferring data. 5 ports of potential from 1 HDMI connection, 3 USB 3.0 connection and 1 USB-C PD charging port. 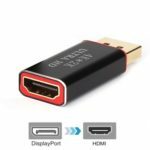 USB-C to HDMI Converter supports video resolution up to 4K*2K, supports large screen TV or display compatible with 4K max. Output. HDMI port switch from phone or laptop video to HDTV, monitor or projector, you’ll never worry blur, distortion and delay. The 3 USB 3.0 ports allow you to connect the keyboard, mouse, flash drive, hard disk to your MacBook Pro or other type-C devices when you connect to HDMI. 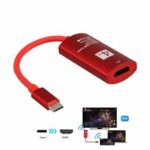 Enables you to easily charge your type-C device while connecting multiple peripherals or transferring data. Suitable for a variety of computers and mobile phones, laptop models such as Dell, Lenovo, Acer, etc. Ideal for home-theater entertainment, office, presentation, exhibition, teaching, etc.